State of the Union has returned from a long hiatus with a new album, new attitude and new singer. State of the Union's architect, Johann Sebastian, has teamed up with vocalist Evannkie to further push the musical boundaries of State of the Union. 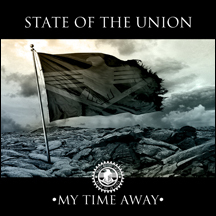 My Time Away showcases State of the Union's more accessible form of Futurepop/EBM, by blending contemporary electronic styles with inspiring lyrics, hard-hitting beats, and symphonic orchestrations. The first single, "Dancing in the Dark" has become an instant club hit, charting in the Top 5 on the German DAC and making the Top 10 on Radio and DJ playlist across the globe. The follow-up single, "My Time Away" should continue the chart success with its high energy spirit, catchy hooks and layers of EDM synths. From start to finish, this album is packed with EDM chart toppers and they even go as far as covering Fictional's megahit "Blue Lights." The WTII version also features two bonus tracks not on the Infacted or Gravitator versions.